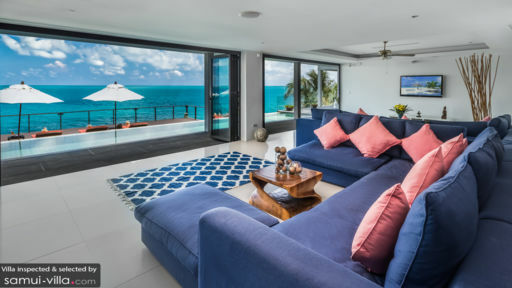 Chaweng beach in Samui is home to the best nightlife and spectacular views of the ocean that you can enjoy endlessly and unhindered at the gorgeous Villa Samayra, a five-bedroom contemporary holiday home right on the edge of a cliff. Overlooking the lapping waves of the ocean, white foam on yellowed rocks, the beautiful property seamlessly blends nature and indoor living with floor-to-ceiling glass walls. The contemporary décor complements the understated lush foliage and clear blue skies to provide a truly mesmerizing space for relaxation and rejuvenation. 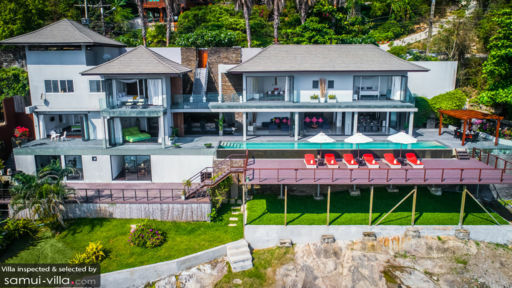 Villa Samayra boasts of five bedroom suites, three of which are found on the first floor of the property whereas the master bedroom and second bedroom are found on the ground floor. Two bedrooms are furnished with king-sized beds and two are furnished with single beds which can be converted to king-sized bed, while one bedroom is furnished with bunk beds suitable for 6 children. Each of these sports elegant décor with hardwood flooring and pristine walls. Floor-to-ceiling glass walls offer a stunning sea view that can be enjoyed day and night. There are TVs, air-conditioners, and other amenities in the rooms. The master bathroom is equally stunning with a lavish, terrazzo bathtub for an almost meditative bathtime. The villa is essentially a home away from home providing the utmost comfort to guests in a way that is bound to leave a lasting impression. An infinity swimming pool, 20-stunning metres in length, spans the ocean and meets it halfway. The splendid view is enough to get you in a relax state of mind as you lounge in the pool or on the sunbeds that are sat facing the panorama. Far across the ocean, you can even view the mountains and the horizon, where the sky meets the sea, for an absolutely life-changing moment! An absolutely stunning, elegant, and crisp poolside living area awaits your arrival at Villa Samayra. It opens out to the pool directly through glass doors which also allows you to view the beautiful ocean from where you sit. The polished floors, false ceilings and minimal décor speaks volumes of the luxe ambiance that engulfs the living space. The sofas are nothing short of fluffy clouds you could simply float on as they’re white and plush. A flat-screen TV has been mounted on the wall to serve as entertainment. A square dining table with long-backed chairs is found right in front of the pool deck so you can enjoy the view while you eat with your friends and family. The glass walls allow you to take in a 180-view of the surrounding land and water for an utterly delightful experience. The kitchen is as fabulous as the living area is minimal with a marble countertop that reflects the overhead lights, an island counter, and immaculate appliances as well as fittings for your benefit. A separate area with two lounge chairs is found right beside massive windows making for a tranquil spot where you can read, enjoy the view, and just cherish the moment. The villa prides itself in offering five-star facilities to guests for a comfortable and memorable stay at Villa Samayra. Housekeeping, breakfast, security, and maintenance is done with great care. There are additional services available upon request and for an extra charge including laundry, car or boat rentals, and massages. 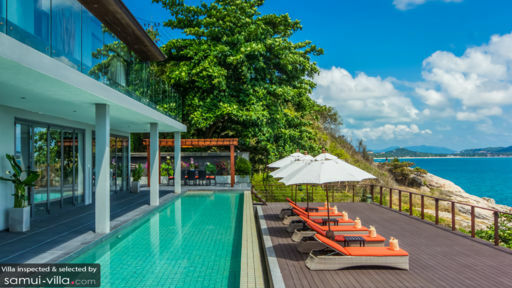 An excellent location in Chaweng near the popular Chaweng beach, guests of Villa Samayra are in luck as they’re so close to all the major attractions in Chaweng including the nightclubs, restaurants, and many shops. There is Lamai beach in the vicinity, also great for a fun night out for some drinks and dancing.